The annual Bay Area Science Festival kicks off on Thursday with 50 events over 10 days. Now in its third year, the event is part of a growing movement of science festivals nationwide. Bay Area residents can dive into the region’s rich scientific research through demos, lab tours, free talks and live performances. You can check out the full schedule, and here are some of our event picks. A talk with J. Craig Venter about rewriting DNA to create synthetic life. 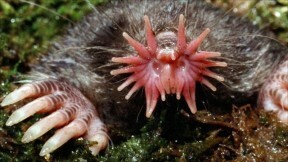 Learn about the sense of touch through the bizarre feelers of the star-nosed mole, plus the development of electronic skin. The much-loved storytelling series delves into creation and chaos at Zellerbach Hall in Berkeley. Board the USS Hornet in Alameda for science demos on space and robotics (plus beer, 21+ only) and a screening of KQED's "Edible Insects." A free science extravaganza filling an entire baseball park with 150 exhibits (including KQED Science). Radiolab hosts Jad Abumrad and Robert Krulwich bring their show to the stage with a slew of special guests.